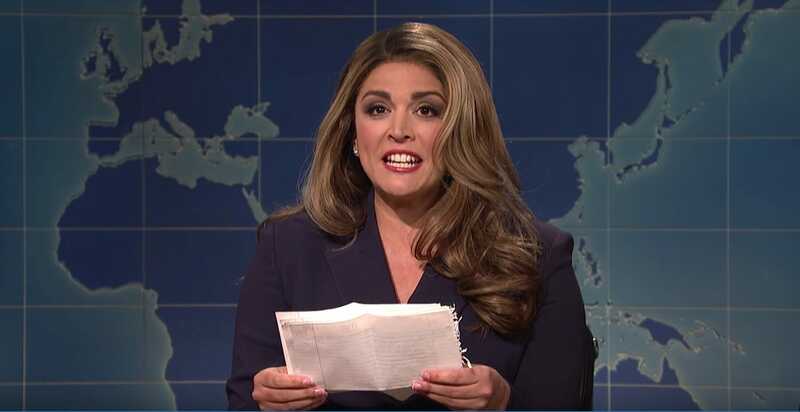 “Saturday Night Live” took on the latest White House news this week, from Hope Hicks’ resignation to President Donald Trump’s gun control plans. There was also an amusing skit about “The Grabbies” award show honouring sexual harassers. Charles Barkley was the host and Migos was the musical guest. After saying how exciting it was to work with “bad boys” at the White House, she read a statement she prepared saying goodbye to all her friends, from senior counselor Kellyanne Conway and President Donald “Donny” Trump to her “BFF” Ivanka Trump. “To everyone else at the Trump White House, I’ll see you guys at the reunion in 10 years – seven with good behaviour,” she said. Sen. Dianne Feinstein, played by Strong, whooped next to him. “She hasn’t been this excited since women were allowed to get jobs,” he said. Echoing Trump’s comments last week that he would have run into the Florida school to stop the shooter even if he didn’t have a gun, Baldwin said the guy with a gun “wouldn’t know what hit him” because he can run so fast. Finally, he said Jeff Sessions should resign, and Kate McKinnon appeared to play the embattled attorney general. The cast interviewed stars on the Red Carpet who were all up for the “coveted Grabby awards” honouring sexual misconduct. The skit skewered Hollywood for rampant sexual harassment on the eve of the Academy Awards. Elsewhere on the episode, host Charles Barkley delivered a monologue about athletes getting political, Leslie Jones reported on her time at the Winter Olympics, and Barkley starred in a parody commercial about arming cockroaches with guns.